Jean Coralli/Jules Perrot, Isadora Duncan, and Doris Humphrey. A Family-friendly Matinee filled with dance, magic, love, and laughter sure to delight all! This all day event is FREE and OPEN TO THE PUBLIC! MOMENTA Marches and Performs in the 14th Annual Disability Pride Parade! Momenta is proud to present the 1st Annual Harvest Dinner and Family Barn Dance! Dancers and their families are invited to join together and celebrate our community with a fun filled evening. The festivities will include a harvest dinner buffet, delicious desserts, games and activities, live music, square dancing for all ages and skill levels, a pie baking contest, pie throwing and more! MOMENTA presents Dance Kaleidoscope – an evening of dance works that reflect MOMENTA’s colorful repertory. Featuring the classical ballet works - Act II of Swan Lake and Fairy Doll; the return of Randy Duncan’s epic Journey; a reprise of audience favorites by Cora D. Mitchell and Gina Sigismondi; and two new physically integrated works by Ginger Lane and Sarah Najera. 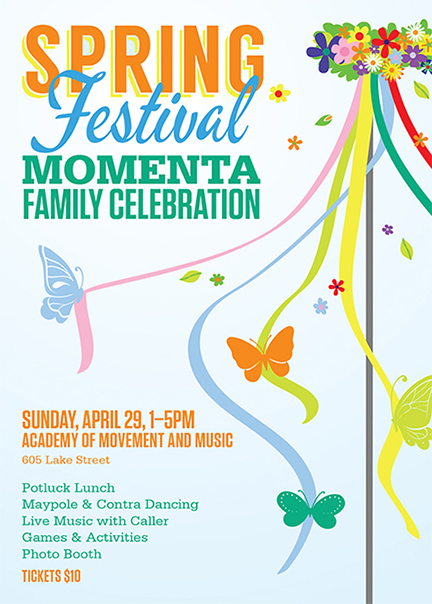 MOMENTA presents Looking Back/Looking Forward: Dances Past & Present. Our Fall Evening Concerts present gems from our historical dance repertory including sections of Paquita, the exotic Polovtsian Dances, Doris Humphrey’s Water Study and Two Ecstatic Themes. Associate Executive Director, Anita Fillmore Kenney, and MOMENTA Alumna, Sage Miller, premiere new work; and 3Arts Award recipient (and native Oak Parker) Kris Lenzo will perform a new physically integrated duet. Our Fall Matinee is a double bill! First we look to the past at Oak Park’s very own modern dance pioneer, Doris Humphrey. Where She Danced showcases Humphrey’s earliest choreographic works, and uses projections to delineate her development from a young dancer in the Denishawn Company to a legendary choreographer. Then our youngest dancers will tell the tale of The Wind in the Willows – ballet based on the book by Kenneth Grahame, and featuring choreography by Stephanie Clemens, Gina Sigismondi and JP Tenuta.